Jambeaux, everyone!!! Harambe! It’s Aaron and Danny’s Trip Report! Welcome to another episode of the Magic Our Way podcast. We are a New Orleans based Disney fan podcast. We appreciate your listening to our show and we hope it brings a smile to your face. We also appreciate your feedback and are committed to listening to our audience. 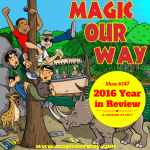 Welcome to the HUB and for this episode, the boys welcome back Danny’s brother-in-law, Aaron, as we discuss Danny’s family trip to Walt Disney World in June of 2016. This show will arrive in two parts and as a result Trip Report 123B will be released later this week. 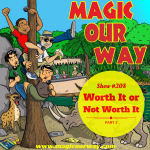 In this Trip Report, we discuss several things regarding Aaron and Danny’ trip to Walt Disney World. They dine at Morimoto Asia in Disney Springs and have quite the tale to tell regarding their experience. Disney Transportation also plays a big part in their trip: a person who hasn’t been there in a while experiences changes that have been in effect that still do not make sense to this day. And, there is much more. This Trip Report is a tough love episode. We care fiercely about the product that Mr. Walt Disney has produced. We are a podcast that wants both sides of the story to be presented so that you can make an educated decision. Call it yin to everyone’s yang or maybe we bring balance to the force. Exercise that critical thinking muscle.